PENTHOUSE 37 is a truly rare five bedroom home of 6,853 square feet with a 2,218 square foot terrace and two private balconies. 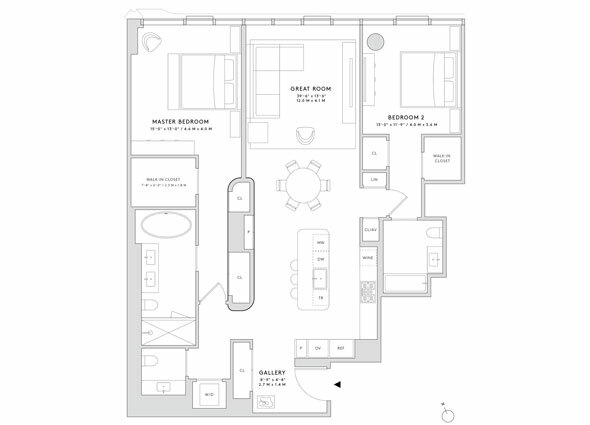 The lower living level features an oversized, corner master suite complete with two large, windowed dressing rooms and two master baths. 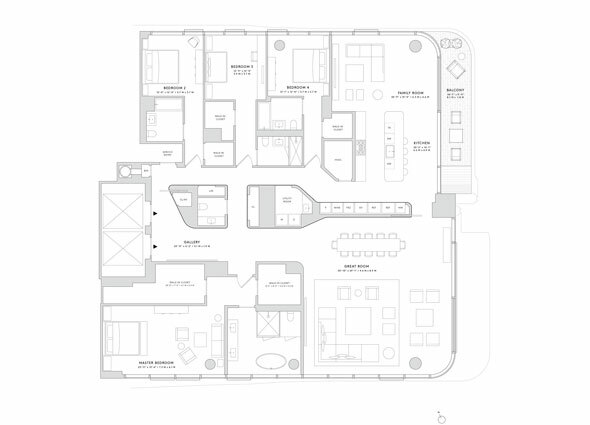 The lower level also features three additional bedroom suites, a utility room and a wet bar. The entertaining level of this grand home offers an expansive double-corner Great Room measuring over 1,250 square feet with fireplace and private balcony. An extraordinary eat-in-kitchen designed by Zaha Hadid in collaboration with Boffi, boasts a sculptural marble-clad island with Gaggenau appliances. A library, a powder room for guests, a fifth bedroom suite and a second utility room complete this level. Oversized motorized windows, ceiling heights up to 10’9”, an internal private elevator and a three-story sculptural staircase designed by Zaha Hadid make this a truly one-of-a-kind property. RESIDENCE 20 is a distinctive four-bedroom home of 4217 square feet with exposures south, east and north and direct elevator entry through a gracious 6’2” wide entry gallery. The oversized Great Room measures over 900 square feet while a separate family room with 199-square foot balcony opens onto an extraordinary open kitchen designed by Zaha Hadid in collaboration with Boffi, boasting a sculptural marble-clad island and Gaggenau appliances. The generous master suite features double walk-in closets, and a windowed bathroom with dramatic black marble feature wall with free-standing bathtub. 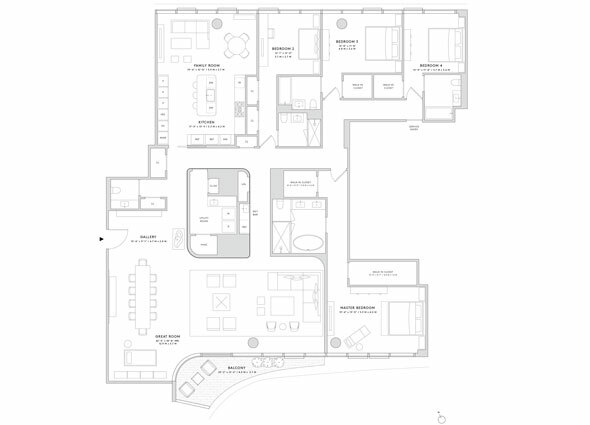 Three additional bedroom suites each feature en-suite bathrooms and walk-in closets. Oversized motorized windows, a powder room for guests, full utility room, dedicated service entrance and sculptural architectural element designed by Zaha Hadid make this a one-of-kind property. .
520 WEST 28TH: 39 UNIQUE RESIDENCES BY ZAHA HADID. Located directly on the High Line in West Chelsea - the center of New York’s art world. The Related Companies has commissioned Zaha Hadid Architects to create 39 unique residences that embody her remarkable design vision and an optimistic vision of the future. RESIDENCE 27 is a distinctive four-bedroom home of 3840 square feet with exposures south and north with a private balcony. The oversized Great Room spans over 42 feet in length while a separate family room opens onto an extraordinary open kitchen designed by Zaha Hadid in collaboration with Boffi, boasting a sculptural marble-clad island and Gaggenau appliances. The generous master suite features double walk-in closets, and an exquisite bathroom with dramatic black marble feature wall with free-standing bathtub. Ceiling heights up to 10’5”, a powder room for guests, full utility room, wet bar and custom wall paneling designed by Zaha Hadid make this a one-of-kind property. RESIDENCE 29 is a distinctive three-bedroom home of 2905 square feet with exposures south, east, and west as well as two private balconies. The oversized Great Room measures over 650 square feet with a signature “curve” window that reflects the exterior design. A separate family room opens onto an extraordinary kitchen designed by Zaha Hadid in collaboration with Boffi, boasting a sculptural marble-clad island and Gaggenau appliances. The generous master suite features large closets, and a windowed bathroom with dramatic black marble feature wall with free-standing bathtub. Oversized motorized windows, ceiling heights up to 10’3”, a powder room for guests, full utility room, dedicated service entrance and sculptural architectural element designed by Zaha Hadid make this a one-of-kind property. 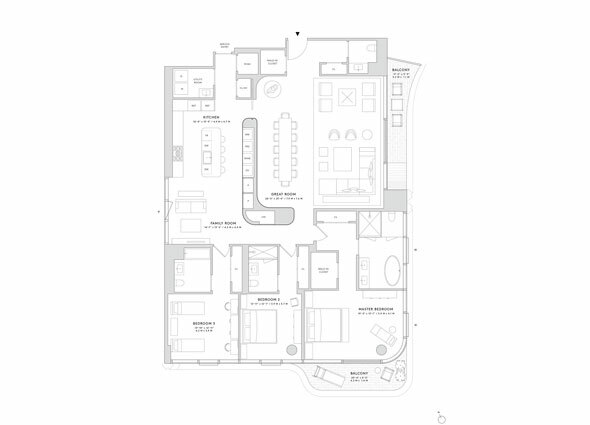 RESIDENCE 12 is a distinctive home of 1717 square feet, with two bedroom suites. The oversized Great Room measures over 500 square feet and includes an extraordinary open kitchen, designed by Zaha Hadid in collaboration with Boffi, boasting a sculptural marble-clad island and Gaggenau appliances. The private master suite features a signature “curve” window that reflects the exterior design and an exquisite bathroom with dramatic black marble feature wall with free-standing bathtub. Oversized motorized windows, ceiling heights up to 10’1”, a powder room for guests, 8 generous closets and sculptural architectural element designed by Zaha Hadid make this a one-of-kind property. 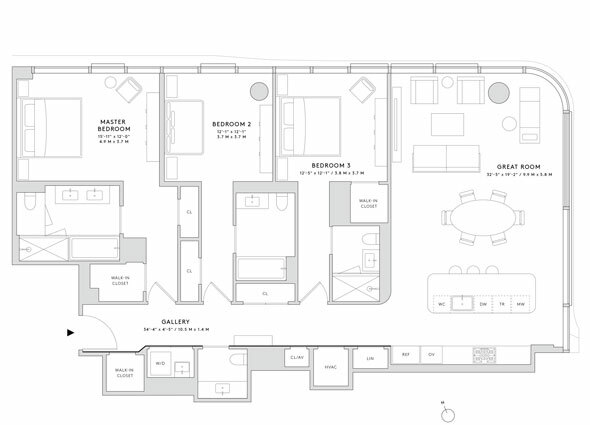 RESIDENCE 5 is a distinctive home of 2,065 square feet, with three bedroom suites. The Great Room includes an extraordinary open kitchen designed by Zaha Hadid in collaboration with Boffi, boasting a sculptural marble-clad island and Gaggenau appliances. The private master suite features a walk-in closet and an exquisite bathroom. 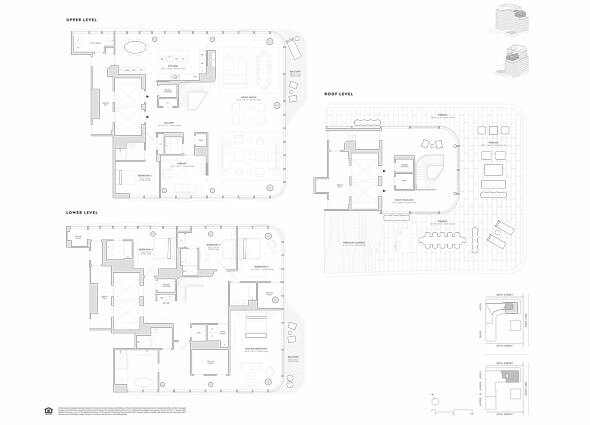 Oversized motorized windows, a powder room for guests, 7 generous closets and sculptural architectural element design.